Two years after Commander Shepard repelled invading Reapers, humanity has a new enemy, methodically destroying human colonies on the outskirts of the studied space. To counter the impending threat, the legendary Spectrum will work with the powerful and ruthless organization "Cerberus", the purpose of which - at any price to save humanity from destruction. 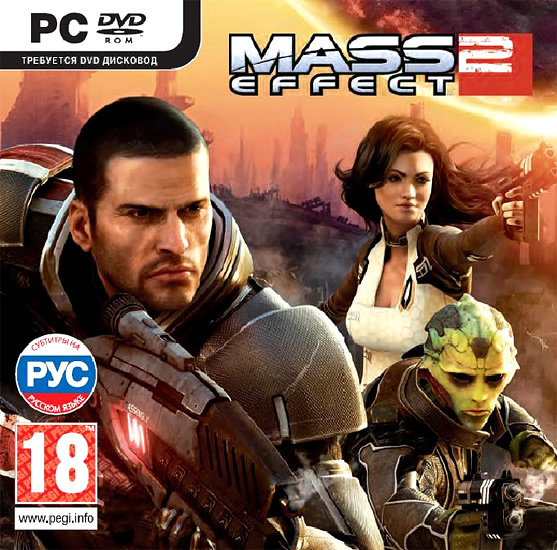 To perform highly responsible and dangerous mission to collect Shepard team of experienced and powerful fighters and take command of the most powerful spaceship in the galaxy. However, many believe that even with such resources, the operation is doomed to failure. Shepard has to prove to skeptics that they are wrong. - The story of the sequel. Players who have passed the first part of Mass Effect, can download the saved data and continue the story of Commander Shepard. - Better than ever. Adventures of those who are only acquainted with the universe Mass Effect, will be no less exciting - the second part of the game even more exciting, dramatic and dynamic than the first. - Irresistible character. Each player can create a main character, shaped his character and by the ability to be improved as the assignments. - Elite Squad. In the course of events under the control of the player will be invincible team, every soldier that has some unique abilities. - Victory at any cost. Improved combat system allows you to use a variety of tactics and twenty classes of weapons - before the power and fury superbly trained and equipped soldiers can not stand any opponent. - Under the strict guidance. An advanced control system, designed for dynamic battle to completely control the situation and seek victory in the toughest conditions. - Embracing the immensity. Command of the spaceship "Normandy", the player will visit the most remote and dangerous corners of the universe, explores the many planets, meet colorful characters, perform a lot of interesting tasks and learn a lot of interesting things about the universe of Mass Effect. 4. After activating the game will appear in the list of games and you can download it from Steam (at the time of the official release of the game in Steam). The installation (download) takes about 15-50 minutes (depending on your Internet channel). We very much appreciate the positive review!